Oy, this is always a painful part for me. It's like having someone critique your baby. And the waiting... always so hard! Some designers don't use test knitters, but I like to have fresh eyes take a look to catch mistakes before I launch a new pattern. Plus it is a great way to hone my writing skills. All good. I did a photo shoot of Stannis in early March but unfortunately my model (my hubby) was a no-show. I have pardoned him; he was at training for his job. So I had to model and take the pics myself. Yikes! Ever test your flexibility? This is a great/painful way to do so. The camera had to be held above and level, the slightest tilt distorts the leg. I tried to use my Olympus 3/4 camera because it has a nifty remote. Waaayyy to heavy to hold still. I do have a tripod but as to where it is? No clue. There is still quite a few packing boxes I have to go through. They are marked, but a huge wall of them are marked as "crafting supplies." I'm pretty sure my tripod is in one of them. Grrrr. So, I grabbed my iPhone 4 and set to work. It was difficult go hold it and press the picture capture button at the same time, but I managed. Photo shoots are something I love to do. Craftsy has a fantastic video class on the subject. Deciding what light, backdrop, accessories, positions and themes is really fun. Originally, I was thinking of shooting my husband's feet near a stone hearth. I had an antique chair with very beautiful dark, scarred legs to use as a prop. Lighting was key; the morning sunlight is the best because it really makes colors pop. Plus, I needed lighting that was natural and would make the stitches pop. I wanted to give a kind of medieval feel/flare to the shoot, since the socks are based on the Stannis character from "A Song Of Ice And Fire" by R.R. Martin. Well, that became a wash due to scheduling conflicts. And I moped. Meh. After a few days, I came up with the idea of resting the sock against a tapestry cushion. Yay! No hubby needed for that. Problem. How to make the sock look its best? I don't own any sock blockers. Rats! And the nature of the fabric does not look pleasing laying without being stretched. Double rats! Oh Stannis, why must you be so difficult? The solution? 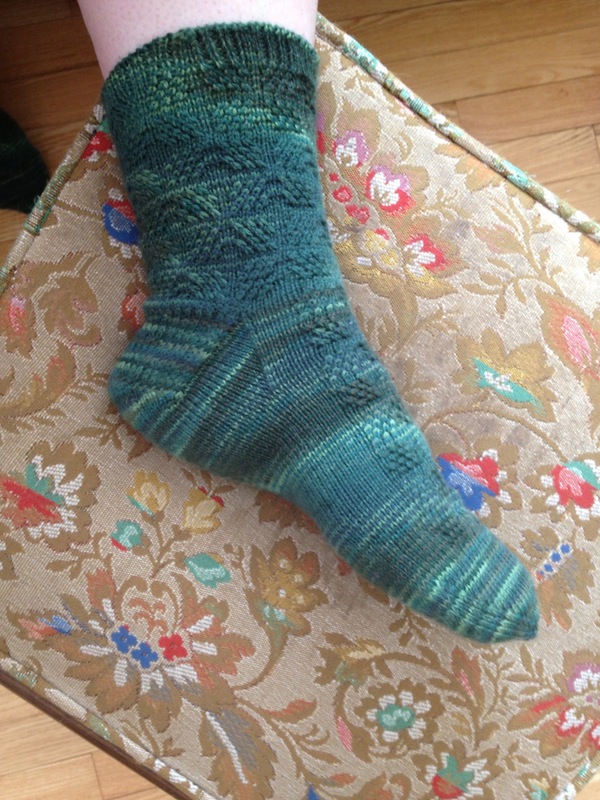 I model socks that were not knit for my foot. Lucky for me I have size 10 ladies feet. Not too bad for an iphone 4.